To say there’s a certain degree of angst in Canada’s business community with respect to the fate of the North American Free Trade Agreement would be an understatement. From corporate leaders to small business owners, industry associations and economic observers, those with a stake in Can-Am trade are waiting with bated breath to learn the outcome of the NAFTA negotiations. In some cases, businesses are likely to put on hold investments in continental supply chains and warehousing until they can have greater certainty that they will see a viable return on those investments under the provisions of a new NAFTA. While the negotiators themselves continue to publicly state a will to find mutually agreeable ground, one can’t help but notice that Canada is quietly creating an environment for trade diversification. In January, well before the NAFTA negotiations began, the federal government announced exploratory talks for a trade deal with China. More recently, the government has announced its openness to similar talks on free trade with the ASEAN (the Association of Southeast Asian Nations), which consists of 10 member countries. This activity adds to the exploratory talks being held with eight Latin American nations, not to mention the Philippines, Thailand and Turkey; as well as already active negotiations with India, Japan, Singapore, Morocco and nearly the entire Caribbean. Perhaps most noteworthy is the deal Canada has already struck with the European Union in the form of the Comprehensive Economic & Trade Agreement (CETA), which eliminates 98% of tariffs in trade with the European Union. 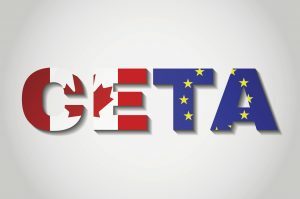 With all the tumult over NAFTA, there’s surprisingly little chatter about the fact that CETA will come into effect on September 21, opening up a market of 500 million to Canadian entrepreneurs, many of whom have risk exposure in a potentially less advantageous NAFTA.